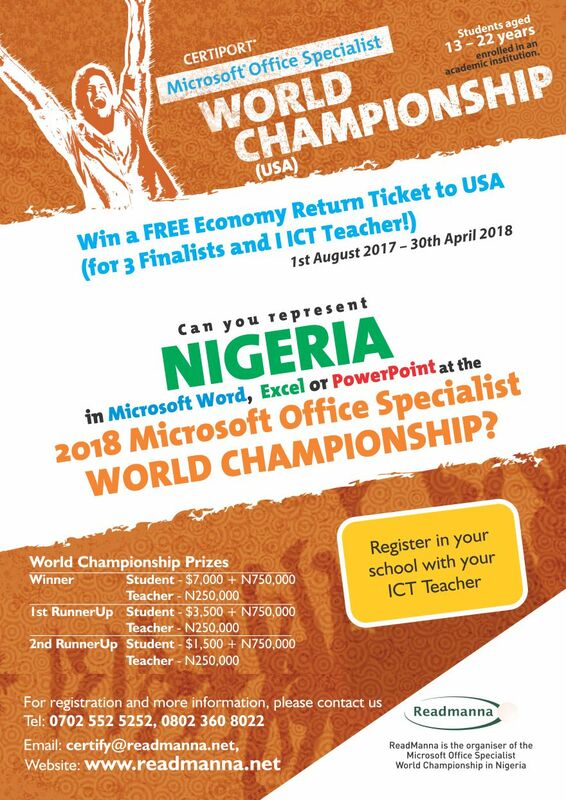 Can you Represent Nigeria in Microsoft Word, Excel or Powerpoint at the 2018 Microsoft Office Specialist World Championship? The Microsoft Office Specialist World Championship challenges students to demonstrate their proficiency in the use of Microsoft Word, Microsoft PowerPoint and Microsoft Excel. This competition is open to all secondary school and university students (ages 13 - 22) with proof of enrolment at an academic institution. The objective of this national competition is to encourage our schools to include the acquisition of basic computer skills required by businesses in their curriculum. This would improve the quality of our graduates and improve their chances of getting employed after school. 3 Finalists and 1 ICT Teacher will Win a Free Economy Return Ticket to USA. Register in your School with your ICT Teacher. Competition Runs from 1st August 2017 Till 30th April, 2018.